“Game-changing indicator! It’s precise. It’s a laser-like. And it’s deadly efficient.” These words are used to describe the Trend Mystery Indicator. This time, we are not dealing with an auto-trading robot for CFD and Crypto but with a plain and simple Forex indicator. What doesn’t change though is the fact that we are all going to get rich… again… for the millionth time. Ok, let’s do this. Unlike the usual robot, Trend Mystery doesn’t connect to a specific broker and doesn’t take over your trades completely. Instead, you will use the indicator on your Meta Trader 4, on your desktop and the broker makes no difference – works on all of them. After installing it on your Meta Trader 4 platform, the indicator will give you signals but you will have to take the actual trade, so it’s not a set-and-forget type of thing, you will have to take some action. The signals can be sent to your phone or to your email (push notifications) and then you can take the trade from anywhere, assuming you have an MT4 platform and access to the internet. 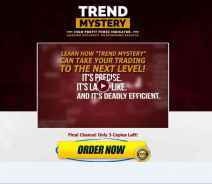 Trend Mystery doesn’t work on any other platform than Meta Trader 4 as it was designed specifically for it. That can be a downside, especially if you don’t know how to use the said platform and how to install indicators on it. Tough luck, I guess. The indicator was produced by Karl Dittmann, who is fairly well-known on the Forex scene as he is constantly churning out money-making indicators and all sorts of tools for getting rich. He even has a website where he sells dozens of indicators, EAs, and other Forex-related products. One thing they all have in common: they promise the world. Do they deliver? Hmm, I wonder. According to him, the Trend Mystery is “designed in a way that an 80-year-old grandma or a 10-year-old kid could easily use it.” And continues by saying “My team and I have pulled out all the stops to create a money-making tool that is 150% easy to use.” Now, I don’t know what 150% easy to use really means and actually doesn’t make a lot of sense to me, but there you have it – it’s easy to use… all 150 percent of it. To be honest, all I see here is buzzwords, marketing and some promises which seem too good to be true. The Trend Mystery Presents: Profits Everywhere! Pips everywhere! Pips and profit… and the words “Final Chance! Only 3 copies left” don’t seem to go away whatever you do. So what happens if you click on Order Now? 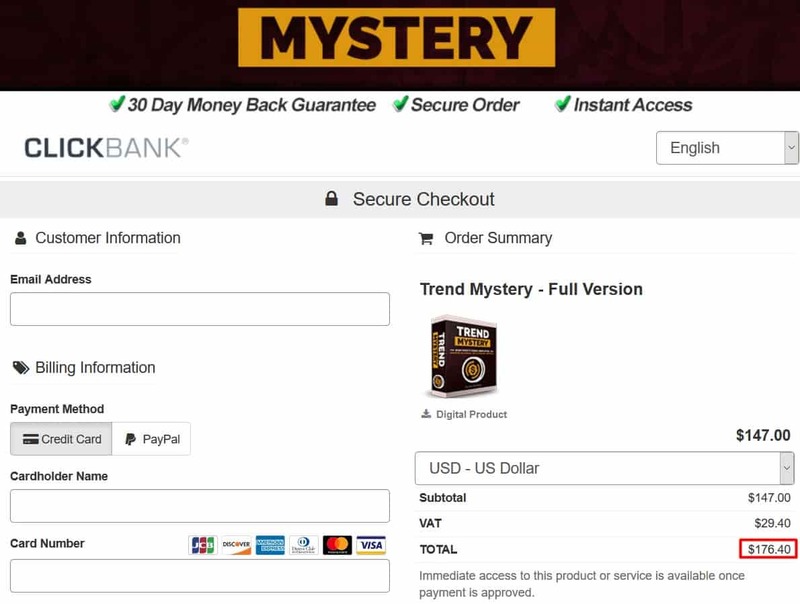 You will be directed to ClickBank to purchase Trend Mystery for the price of only $147 ($176 after adding VAT), discounted from $395. Yes, this is a money making tool that actually costs money, unlike all the CFD and Crypto autotraders that will make you millions and cost zero bucks. But having a price tag doesn’t automatically mean it’s a good product and one question lingers in my head (actually more than one but let’s focus on this one): why is Karl Dittmann offering so many products on his website? Duh, because having more than one product increases the chances of selling of course. But if all of them are the Holy Grail of trading, why not stop at one. I mean if you find the Golden Goose, you are already richer than you need to be. So why go out in search of another Golden Goose? Wrapping It Up: Is Trend Mystery Worth It? The way Trend Mystery works is still a mystery! At no point, Mr Dittmann explains how the signals are generated. 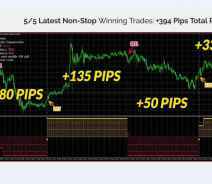 All we get is talk about how easy it is to use, how accurate and how many pips you will get. I’ve been trading Forex for little less than 10 years now and I can tell you that perfect results like the ones presented in his pictures are not achievable under real market conditions. At least I never came close and I haven’t heard of anyone that did. But just because I couldn’t do it doesn’t mean it can’t be done. I have to pinpoint something else out: if a Forex trader would be able to build a tool that does what Trend Mystery claims to do, he would NOT think about selling it. He would be trading it day in and day out! But then again, different strokes for different folks. I am not calling this a scam, I am just telling you to do your due diligence. Great News! We have found a Robot that will make you so much richer in less than 30 working days! Show me the Robot!. Wrapping It Up: Is Worth It?